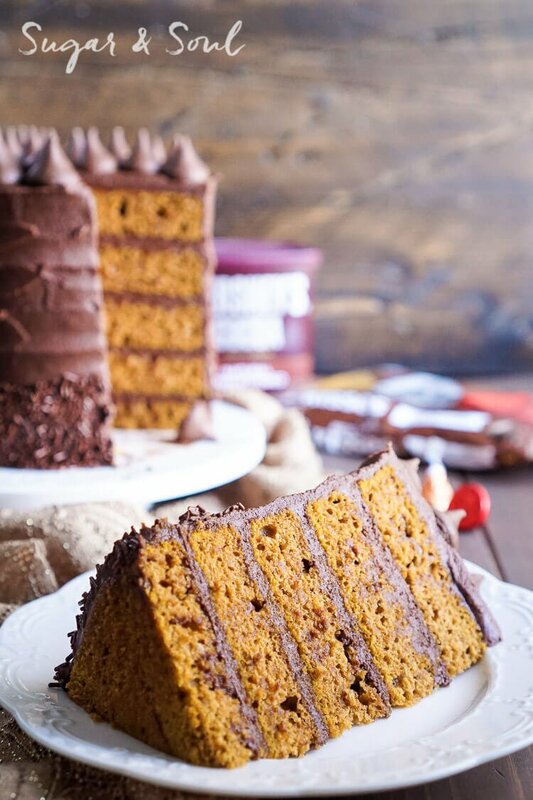 This Chocolate Pumpkin Cake is the ultimate pumpkin and chocolate combo for fall! 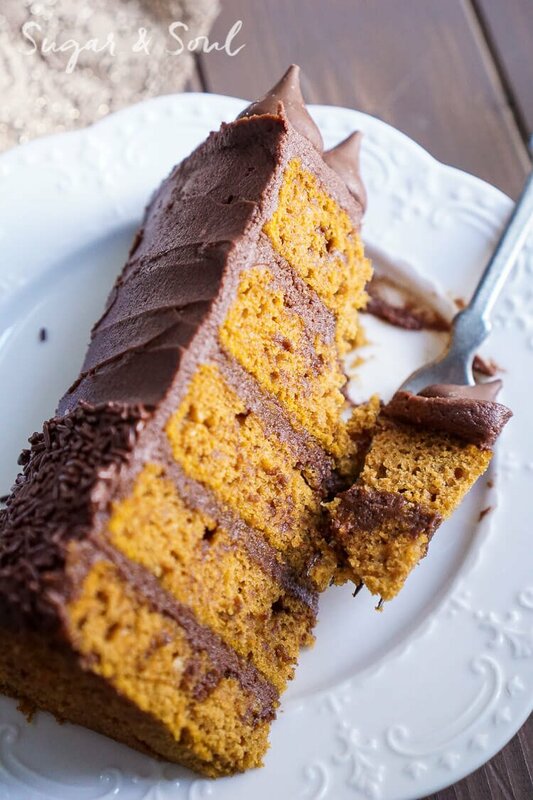 Five layers of sweet and fluffy pumpkin cake wrapped in a whipped chocolate buttercream frosting! I know we all love pumpkin chocolate chip cookies, but when it comes time to impress those guests they’re just not going to cut it, you need a dessert that shines!!! And I’d like to think that these 5 layers of pumpkin cake will fit the bill and leave everyone drooling! Now, I love pie, pie is awesome, but I always want something else on the dessert table at Thanksgiving. I mean who only eats one dessert on Thanksgiving, I sure don’t, but I want more than pie! That’s why this cake should be on every Thanksgiving table from now until the end of time. People want options! So make some new traditions (including this cake) and laugh and eat and make memories with the ones you love (while eating this cake). Am I getting my point across yet? 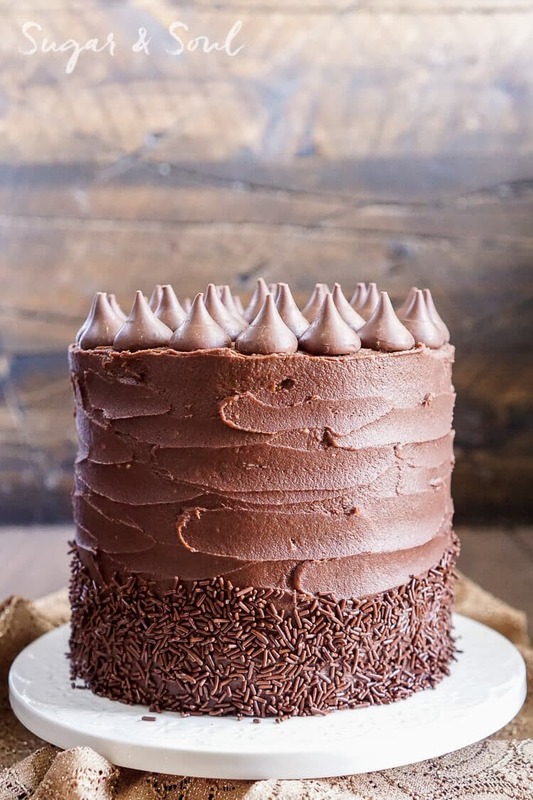 Go make this cake! 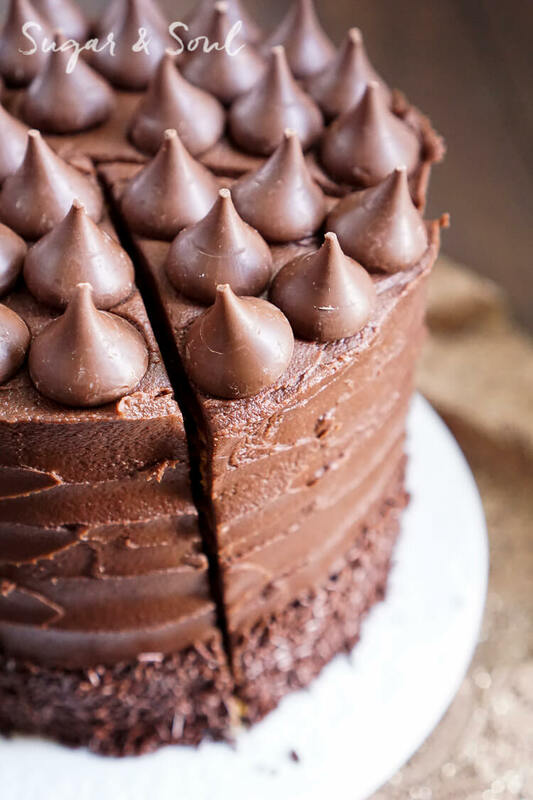 I mean, come on, you know you can’t resist the sweet temptation that is this cake! Please refrain from licking the screen though, mmmkay? But don’t let these five layers intimidate you, this isn’t MasterChef and you don’t have to make it in 30 minutes with Gordon Ramsay screaming at you. Take your time and enjoy being in the kitchen this holiday season creating delicious recipes with Hershey products that you can make traditions and memories around! 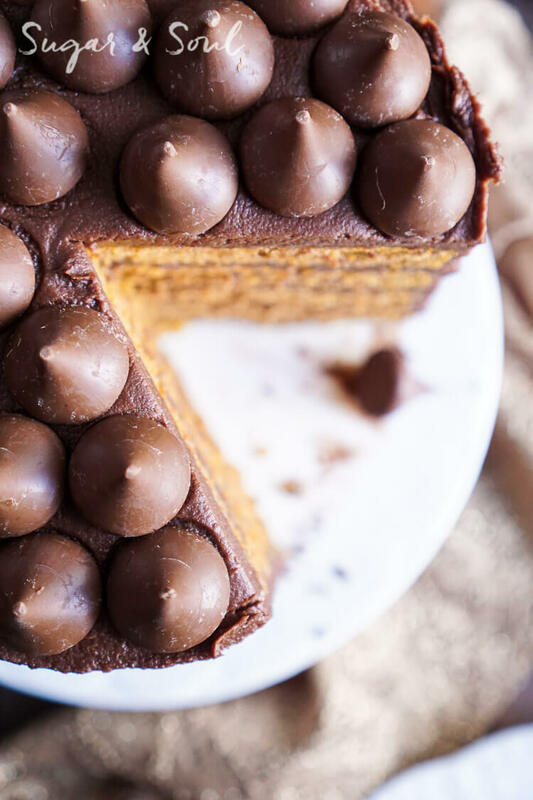 This Pumpkin Chocolate Kisses Cake is the ultimate pumpkin and chocolate combo for fall! 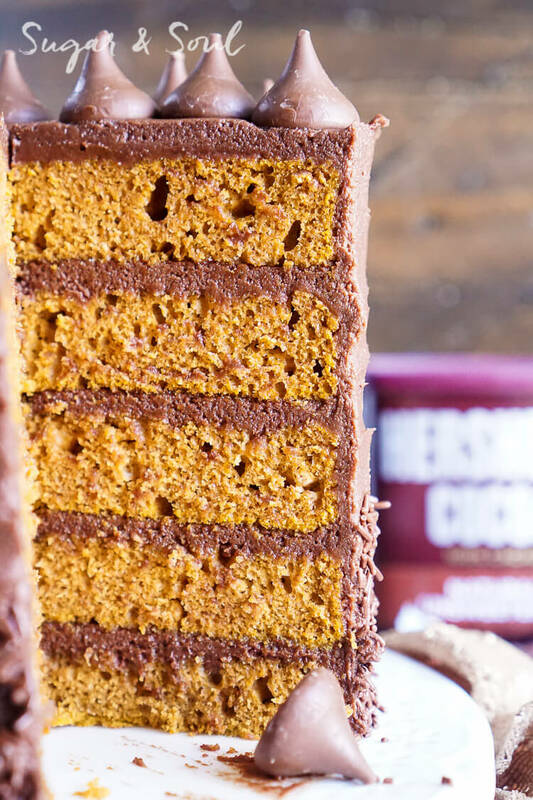 Five layers of sweet and fluffy pumpkin cake wrapped in a whipped chocolate buttercream frosting! Spray 5 6-inch cake pans with cooking spray and set aside, if you don't have 5, just bake in batches. Combine all cake ingredients in a large bowl or stand mixer and beat until combined. Add 1 cup of batter to each pan and bake for 20-25 minutes until toothpick comes clean from center of cakes.Cakes should also be pulling away from the edge of the pan. Let set in pan for a couple minutes before gently running a knife along the edge of the pan and flipping onto a cooling rack to finish cooling. Cut the domes off the tops of the cakes so they're nice and even. Place first layer on a cake stand or cake board on a turn table. Scrap down sides and add confectioners' sugar a cup at a time, mixing between cups and scraping down. Add cocoa powder, vanilla extract, and salt and beat on low until fully incorporated. Gently spread about 1/4 cup of frosting between each layer of cake, stacking nice and straight as you go. Then gently frost the whole cake with a light crumb coat and let set for 20 minutes, you can also place it in the fridge. Add final layer of frosting to the cake for a finished look. 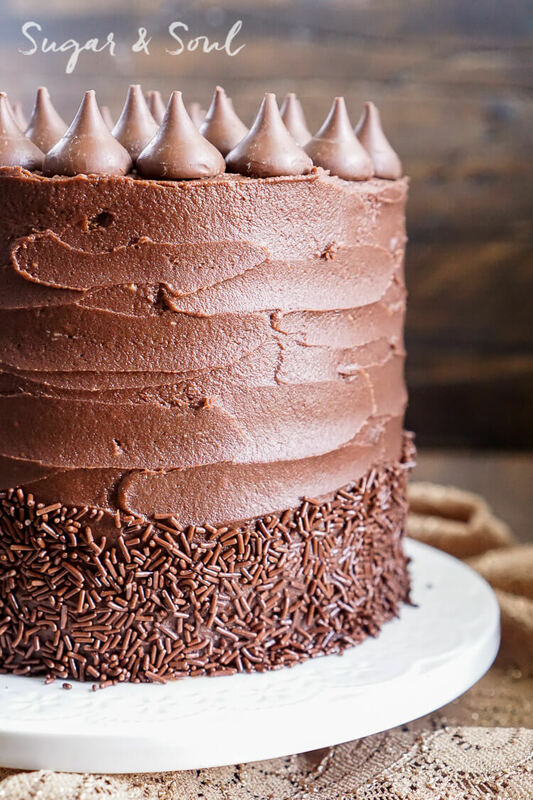 Top cake with Milk Chocolate Hershey's Kisses and gently press sprinkles into the side of the bottom of the cake. Watch this video to show you how to apply sprinkles. Under ingredients there is no amount of oil just a ? I just fixed it, Tina, the measurement got lost in my recipe card transition I did recently.